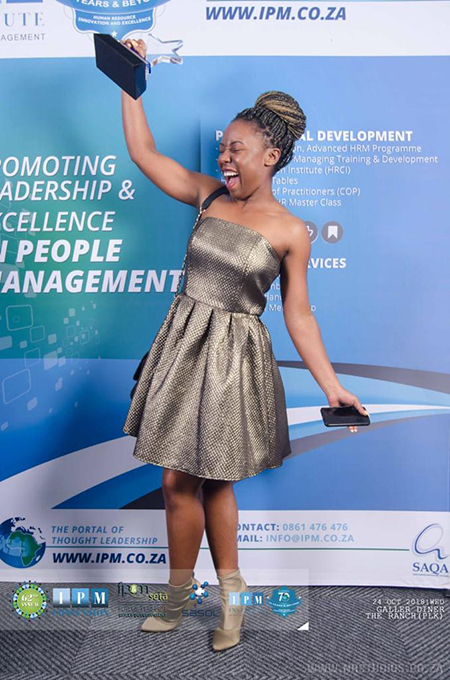 The youngest PhD graduate in Africa, 24-year-old Dr Musa Suarombe, has been named the Institute of People Management’s (IPM’s) Youth Leader of the Year for 2018/2019. Dr Suarombe, a postdoctoral fellow at the North-West University’s (NWU) campus in Mahikeng, was recognised by the IPM for her innovative leadership skills and her growing influence in her field of expertise. 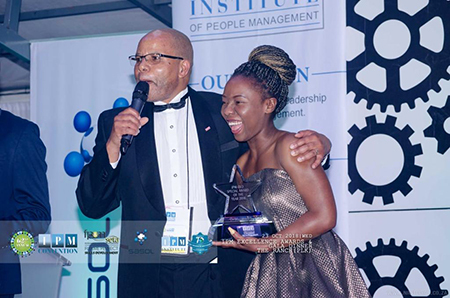 According to the CEO of IPM, Dr Jerry Gule, the fact that Dr Suarombe obtained her PhD in industrial psychology from the NWU at just 23 years, among other considerations, played a major role in her being named Youth Leader of the Year. “Musa is most deserving of this award. We are honoured to have the youngest PhD in Africa sprout from our field of industrial psychology and human resource management. I am astounded to see the influence she has, as well as the drive and passion se instils in other young researchers and professionals,” says Dr Gule. Dr Suarombe grew up in Gaborone, Botswana, and received her BCom and BCom honours in human resources as well as her MCom in talent management from the NWU, before embarking on her doctoral studies. Her success bears testimony to that. Dr Musa Suarombe can be contacted on 060 403 1649. Dr Jerry Gule with Dr Musa Suarombe. Pure elation! Dr Musa Suarombe can't hide her joy at being named Youth Leader of the Year.